Ladies and Gentlemen, your New York State College Tech University A&M Knicks. 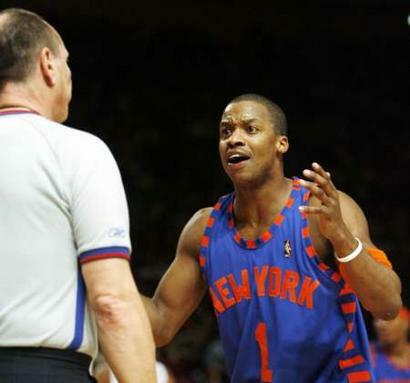 Steve Francis’ first game didn’t go as well it might appear and the final score wasn’t an indicator of how bad New York actually played last night in a 94-90 loss to New Jersey. The Knicks went scoreless for the first four an a half minutes as the Nets built an early ten point lead and never look back. Eventually the lead skyrocketed to 21 before the home team managed to start a comeback. While they did look exciting at times, Francis was overmatched on defense when he switched between guarding Richard Jefferson and Vince Carter, who scored a combined for 53 points. Early on, it looked like the Nets set out to prove just how ridiculous Isiah Thomas was as they exposed the clear mismatches that having three guards on the floor at all times might create. Something that will be recurring for the rest of the season: Fans at Madison Square Garden began to chant “Fire Thomas” at the end of the game proving even further that only Isiah and maybe Larry Brown believe running a Villanova-esque offense in the NBA could work. Posted by Dan McGowan at 2/25/2006 hype it up!